Kids can collect eggs from the carnival games! Each year Katy Ebert, our Music Director, prepares a special music ensemble and works with our volunteer choir members for an Easter Sunday "cantata" - special music with great folks - a musical message for everyone - and it's fun. Our Music Director, Katy Ebert, prepares special music for Easter Sunday, Palm Sunday, and Christmas. Katy works with church member volunteers to rehearse and present a musical message for all to receive and enjoy. It is an effort of love - and there is usually a special guest with additional inspirational music performed by those with truly special talents. 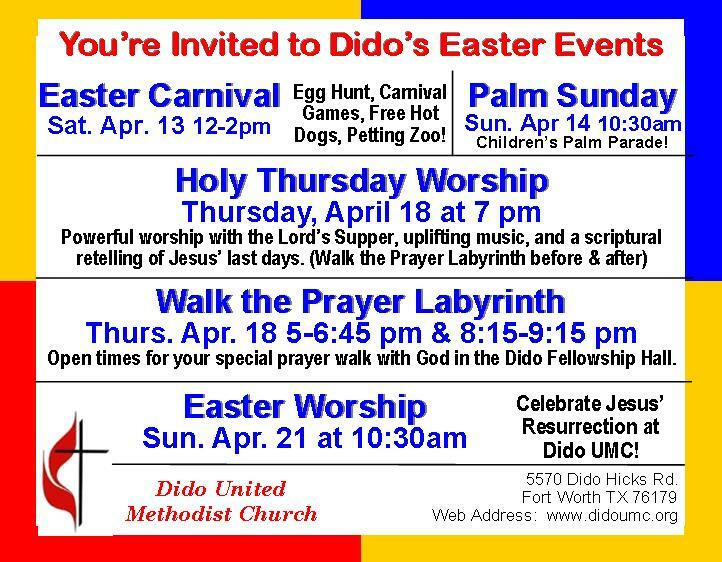 We honor the tradition of Holy Week - especially Palm Sunday - and the message of our Christ, Lord and Savior. The kids especially enjoy the palm branches that fill the sanctuary and the special Holy Message for them.